Yoshua Okón, Oracle, 2015, four-channel video installation, color, sound, 24 minutes. Earlier this year, Mexican artist Yoshua Okón travelled to Oracle, a small Arizona border town, to record the AZ Border Protectors. Oracle, 2015, the resulting four-channel video installation, includes footage Okón shot of the group reenacting a protest it had staged in 2014 against unaccompanied minors who crossed the border in record numbers that summer. The work will be on view in a show curated by Julio Cesar Morales at the Arizona State University Art Museum in Tempe from July 4 through August 22, 2015. ORACLE includes a chorus of nine Guatemalan kids from the approximately sixty thousand unaccompanied minors who migrated to the US last year. They sing a song based on a US Marines’ Hymn that narrates a history of US invasions beginning with the invasion of Mexico in the nineteenth century (“From the halls of Montezuma...”). In this version, the kids sing about the invasion of their own land—beginning with a CIA-led coup in 1954—with specific emphasis on the complicity of the CIA and the United Fruit Company. The second section of the work is a two-channel diptych in which we see one of the protesters driving in circles—a metaphor for nationalism—in a white truck with a huge US flag. He is shooting his guns out the window. 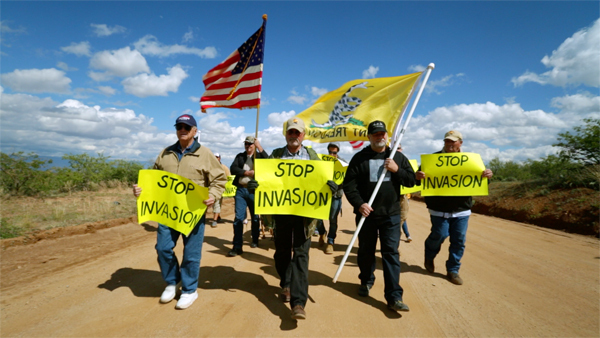 Last year, I learned about the protests when I saw a picture of a lady in Oracle holding a sign that read, “Stop Invasion.” Knowing the history of the US invasion of Guatemala, I found this image incredibly ironic and revealing of the nationalist bubble in which most people in the US live. The arrival of these kids to the US is a direct result of US foreign policy, but the root causes are almost never brought into the immigration debate, be it in conservative or progressive circles. The right-wing media tries to make the anti-immigration groups look like heroes who are defending America, while the media on the left tries to make them look like dehumanized, racist, and fanatic savages, and tries to portray them as the source of the problem. Some people from the counterprotest in Oracle even compared them to the KKK, which is a big distortion. Many of the people involved in these groups are mixed-race and they openly acknowledge it. This is not about race. These people are angry because they feel the national pact has been broken; they feel betrayed and frustrated by the complicity between the government and transnational corporations. But holding on to nationalism is making matters worse and generating a lot of hatred against immigrants who are victims of the same forces the protesters are ultimately opposing. I titled this piece Oracle as a reference to the town as well as to the Oracle corporation, which has strong ties to the CIA and also symbolizes our current geopolitical paradigm, where it is increasingly difficult to distinguish between governments and corporations. Oracle is a very small town. It wasn’t long before I was able to interview the leaders of the protest. I presented myself as an artist who uses video and told them that my goal was to put their issue on the table and then let people make up their own minds. I told them that I am not pro or against them—which is true. I assumed they liked attention and cameras, so I decided not to interfere much and to let them do their thing. The protesters even offered to perform what they call “Camouflage Operations” for my camera. You have to remember that most members in these militias are ex-cops or ex-military. These secret activities mimic special-ops missions. For instance, they mentioned to me that they did some camouflage operations to monitor the Sycamore Canyon Academy, where the Central American kids were taken. But, as tends to happen with these kinds of works, after a few days they began to feel exposed, so they canceled the extra shoot. I wouldn’t say that the protesters completely take control of their own image in Oracle, but I would say that the portrayal I am constructing gives a wider perspective and is more nuanced than the mainstream media. To me, as a symptom both of the disastrous effects of neoliberal capitalism and of the inadequacy of nationalism to counteract these effects, the anger of the Oracle protesters should be taken seriously.